In 1948 Beech built as a private venture a two-seat trainer developed from the V-tail civil Bonanza. 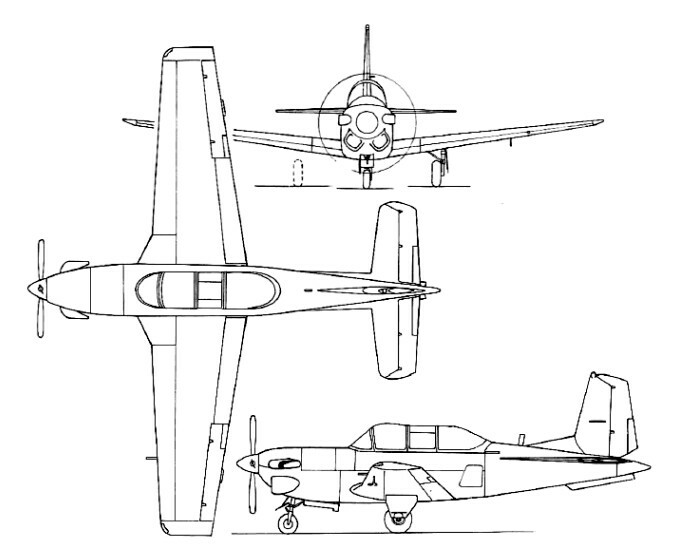 Having tandem seating for pupil and instructor and a conventional tail unit, the aircraft was designated Beech Model 45 Mentor, and flew for the first time on 2 December 1948. USAF evaluated three examples of the Beech Model 45, two powered by the 153kW Continental E-185-8 engine and one by the 168kW Continental E-225-8; all three were designated YT-34 by the USAF. These three aircraft made their first flights in May, June and July 1950, and were tested extensively during a competition period, being flown not only by evaluation pilots, but also in the primary training role with pupils and instructors. 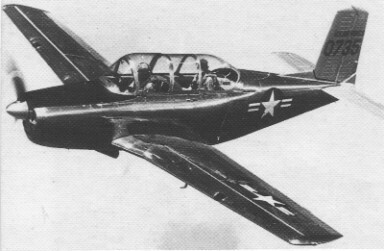 On 4 March 1953, the USAF selected the Model 45 as its new primary trainer, under the designation T-34A Mentor, and ultimately 450 were built for that service, 350 by Beech and 100 by the Canadian Car & Foundry Company in Montreal, Canada. An initial order from the USAF for 34 aircraft was followed by one for 25 from the RCAF and yet another from the USAF for 66. RCAF plans were changed after only one training course and in 1955, 23 of its Mentors were donated to the Turkish Air Force. The last complete airframe to be built by Car-Car was the T-34A Mentor. US Navy evaluation of the Model 45 began soon after the USAF had placed its initial contract with Beech, and on 17 June 1954 the Navy ordered 290 under the designation T-34B. A total of 423 were acquired eventually. In July 1951 one of the original prototypes was modified to mount two 7.62mm machine-guns in the wings, with provision additionally for underwing racks capable of accepting six rockets or two 68kg bombs; this was evaluated by the USAF as a potential light close-support aircraft, but no orders materialised. The US Navy decided in 1973 to investigate the possibility of retaining the Mentor in service, with its piston engine replaced by turbine powerplant. To evaluate this proposal, the USN instructed Beech to convert two T-34Bs to turbine power, under the designation YT-34C. The powerplant chosen by Beech for the conversion was a Pratt & Whitney Aircraft of Canada PT6A-25. In this particular application it is provided with a torque limiter that restricts power output to some 56 per cent of maximum, ensuring constant performance over a wide range of altitude/temperature conditions, and also offering long engine life. The first YT-34C was flown on 21 September 1973, and following satisfactory evaluation of the two aircraft, Beech received contracts valued at approximately $72 million for the construction of 184 new aircraft. In addition to the installation of the new engine, the production aircraft were also given structural strengthening to ensure an airframe fatigue life of some 16,000 hours. The first T-34C Turbo-Mentor entered service with the USN's Naval Air Training Command in November 1977, and student training with the type began during the following January. Since then production has reached 353, with six being transferred to the US Army. The landing gear was designed to survive the hard simulated carrier land-ings practiced by student pilots and angle-of-attack indicators, a necessity for carrier approaches, are standard on the T-34C. Even though the Beeches are not operated on carriers, new Navy pilots become aware of the importance of angle of attack right from the beginning. Power-off stall speed with gear and flaps down is 56 knots; the stall warning is a rudder shaker felt as a shudder in the pedals when approaching the stall. On 24 June 1976, the US Navy replaced both its North American T-28 Trojan and Beech T-34B Mentor trainers by the improved Beech T-34C turboprop-powered version of the Mentor. Beech developed a T-34C-1 version for armaments system training, equipped with four underwing hardpoints with a total weapons capacity of 544kg. Examples of this version have been supplied to the navies of Argentina, Ecuador, Peru and Uruguay, and to the air forces of Ecuador, Indonesia and Morocco. An export civil version, known as the Turbine Mentor 34C, has also been delivered for use in Algeria's national pilot training school. In Japan, the Fuji company built 176 T-34s for their own and the Philippine military forces. The Canadian Car and Foundry produced 125 Mentors, and an additional 75 were assembled in Argentina. Initial climb rate 1120 fpm. Takeoff distance (50ft) 1200 ft. Landing distance (50ft) 960 ft.
Engine: Continental O-470-13, 225 hp. Engine: Pratt & Whitney PT6A-25, 400 shp. Length: 28 ft 8 in. Height: 9 ft 11 in. Wingspan: 33 ft 5 in. Max ramp weight: 4,325 lbs. Max takeoff weight: 4,300 lbs. Standard empty weight: 3,003 lbs. Max useful load: 1,297 lbs. Max landing weight: 4,300 lbs. Max usable fuel: 130 USG/845 lbs. Max rate of climb, sea level: 1,440 fpm. Max rate of climb, 8,000 ft: 1,350 fpm. Max operating attitude: 20,000 ft.
Max speed (17,500 ft): 214 kts. Cruise, max power at 17,500 ft: 214 kts. Cruise, max range at 20,000 ft: 186 kts. Fuel flow at max cruise: 39 USGph. Endurance at max cruise, no res: 3.3 hrs. Stalling speed, clean: 74 kts. Stalling speed, flaps down: 56 kts. Turbulent air penetration speed: 195 kts. Engine: 1 x P&WAC PT6A, 300 kW. Initial ROC: 660 m / min. T/O run (to 15m): 595 m.
Ldg run (from 15m): 470 m.
Wingspan: 32 ft. 10 in. Overall length: 27 ft. 8 in. Wheel track: 9 ft. 7 in.